Elias Kadadu, a patriotic young man, grew up in Flint, Michigan. He moved to Florida in 2011 to pursue a degree in Culinary Arts from the Le Cordon Bleu academy in Orlando. His culinary skills developed as a young child working in his father's restaurant but Elias craved a career working with people and building up communities. 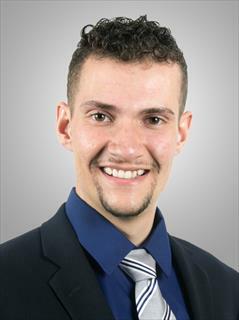 With an optimistic, outgoing personality and a huge heart he envisioned himself to become the caring professional the real estate industry needed. Elias has always treated his past employments like his own businesses. He has worked in the kitchen as a prep and line cook, he has worked as a waiter in a fine dining restaurant and he has also scratched the surface of construction working with his older brother, Antonio Kadadu, renovating Marriott hotels. Elias is a huge family man, he has one brother, three sisters and is an uncle to his beautiful baby niece. His father, Joule Kadadu is a Christian-Arab from Nazareth, Israel and his mother, Amy Hawkins is also a Christian from Millington, Michigan. Elias attends Vous church on Sundays and believes he shouldn't keep his beliefs separated from his business. Elias's hobbies include spending time with family, cooking, outdoor adventures, and attending social events. His passion for real estate grew strongly when he discovered the immense burden homeowners faced when selling their properties. He loves helping others and Elias thought what better help he could bring to people than to make the home selling and buying experience a little less stressful. Elias is licensed with one of the best family owned brokerages in South Florida, Balistreri Real Estate - a trusted name for 55 years! He is very blessed to have met the owner and CEO of the company, Jim Balistreri, Elias strongly believes his employment with Balistreri is a blessing. Balistreri isn't just a company, it's a family and families are there for each other. That family relationship is exactly what Elias brings to each of his clients.